Slovenian President Borut Pahor in the U.K.
Tradicionalna prireditev Dobrodošli doma bo letos 6. julija 2019 v Radovljici. Vabimo rojakinje in rojake, ki živite v zamejstvu in po svetu, da se nam na ta dan pridružite. Skupaj z vami bomo izoblikovali pester in bogat kulturni ter športni program. Letošnji dogodek organiziramo društva: Združenje Slovenska izseljenska matica, Svetovni slovenski kongres, Slovenija v svetu in Rafaelova družba pod pokroviteljstvom Urada Vlade RS za Slovence v zamejstvu in po svetu. Pripravili bomo nastope različnih glasbenih, folklornih in pevskih skupin, razstave, srečanje mladih raziskovalcev, predstavitve nagrajenih diplomskih in magistrskih nalog, nogometne tekme… Organizirali bomo tudi izlete v okolici Radovljice. Prijave za sodelovanje na prireditvi ali samo za obisk in izlete zbiramo do 5. maja 2019. Prijavite se na spodaj napisane e-naslove kjer boste dobili tudi vse ostale informacije povezane s prireditvijo Dobrodošli doma. 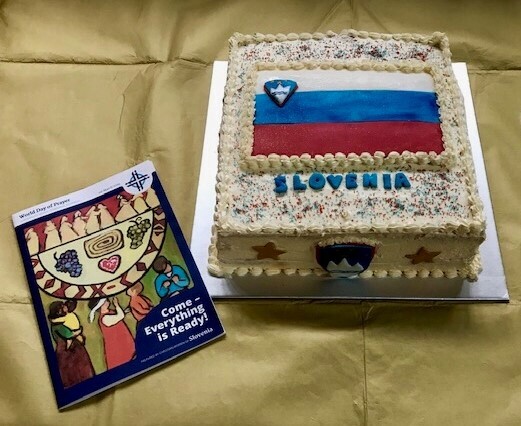 On World Prayer Day for Slovenia on Friday March 1st, 2019, the British-Slovene Society helped arrange a service at the lovely St. Margaret’s Church in London opposite Westminster Abbey and the Houses of Parliament. Those taking part in the service could see some typical Slovenian books and artefacts, including the Poems of France Prešeren and a model of a Slovenian ‘Kozolec’ (Hayrack). Celia Scott, Canon Sinclair, Linda Ulrich, Deacon Saunders and other World Day of Prayer volunteers helped make this a very warm occasion. British-Slovene Society Trustee Simona Bennett, former Trustee Breda Wilkinson and Karen Košak gave readings. Trustee Miha Košak helped coordinate, and Špela Vrbnjak of the Embassy of the Republic of Slovenia provided further support. Each year a World Day of Prayer is devoted to a different country. 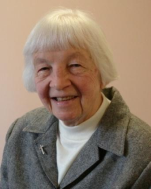 Born into a devout Ljubljana Catholic family in 1928 as one of four girls with nine brothers, Sister Terezija (Rezka) Žužek led a remarkable life as a mission doctor around the world. She died in Marian House, Uxbridge, on 26 January 2019 at the age of 91. The Žužek family fled Slovenia in 1945 after the Communists took over what was then Yugoslavia. After several years in an Italian refugee camp, Rezka and her sister Agnesa went to Spain, where she graduated with a medical degree from the University of Zaragoza. Rezka and Agnesa both decided on careers as mission doctors in a Catholic religious congregation. They joined the Medical Mission Sisters in South Shields, England, and took their first vows there in 1958. Sister Rezka subsequently served for many years as a mission doctor in Pakistan, South Vietnam, Yemen and Peru. On her return to the U.K. in 1994, she became a prison visitor to Holloway Women’s prison in London. It then contained many women from Eastern Europe and South America who had been bribed by drug dealers to carry drugs. Rezka’s language skills were invaluable, as was her gentle, kind approach. She helped the women to keep contact with their families, and gave them encouragement and support. Her two surviving brothers, Stane from Argentina and Andrej from USA, attended her funeral. Rezka was a longstanding member of the British-Slovene Society. Slovenian President Borut Pahor visited the U.K. this week. After a meeting with HM Queen Elizabeth II on 28 February, he addressed a reception for 200 guests hosted by the Slovenian Embassy in London. 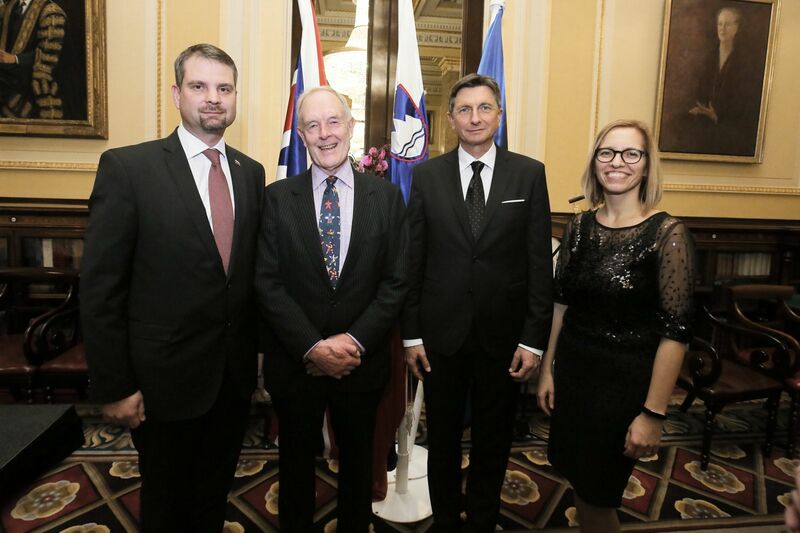 Pictured here with David Lloyd, Chairman of the British-Slovene Society (centre), and Ambassador Tadej Rupel and Valentina Rupel. Veleposlaništvo Republike Slovenije vabi slovenske državljane, ki prebivajo v Združenem kraljestvu, na informativni dogodek o bodočem statusu državljanov držav članic EU po izstopu Združenega kraljestva iz EU. Na vprašanja bodo odgovarjali neodvisni strokovnjaki. V primeru, da imate konkretna vprašanja svetujejo, da jih vnaprej posredujete v angleškem jeziku na rsvp.vlo@gov.si. www.facebook.com/ECinUK in bo na razpolago še nekaj dni po dogodku. I feel that I must apologise, as a former British ambassador to Slovenia, for the ill-chosen words of our Foreign Secretary during his recent visit to Slovenia, referring to Slovenia as a vassal state of the Soviet Union. I am sure that Slovenians will brush this aberration aside with their customary goodwill, but I am deeply embarrassed. I look forward to seeing you on Wednesday evening at President Pahor’s Reception. John Corsellis, who died last November, has been posthumously awarded the Order of Merit of the Republic of Slovenia in London. The award was made for his work as a humanitarian aid worker caring for several thousand Slovene refugees in Displaced Persons camps in Austria in the years after World War II. 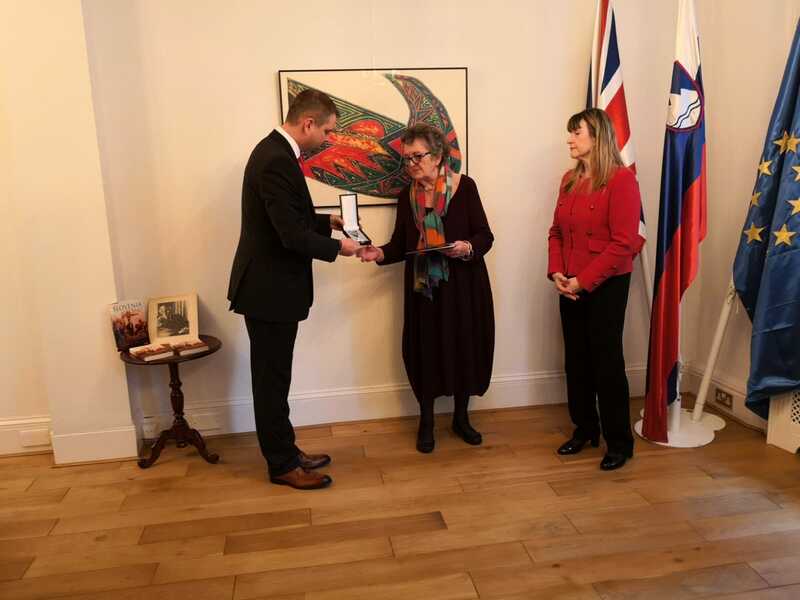 Tadej Rupel, Slovenia’s Ambassador to the United KIngdom, presented the award to John’s widow, Ann Corsellis, in a ceremony at the Slovenian Embassy on 4th February also attended by John’s three children, a grandson and family friends. John was co-author of a book entitled Slovenia 1945 published in 2005. 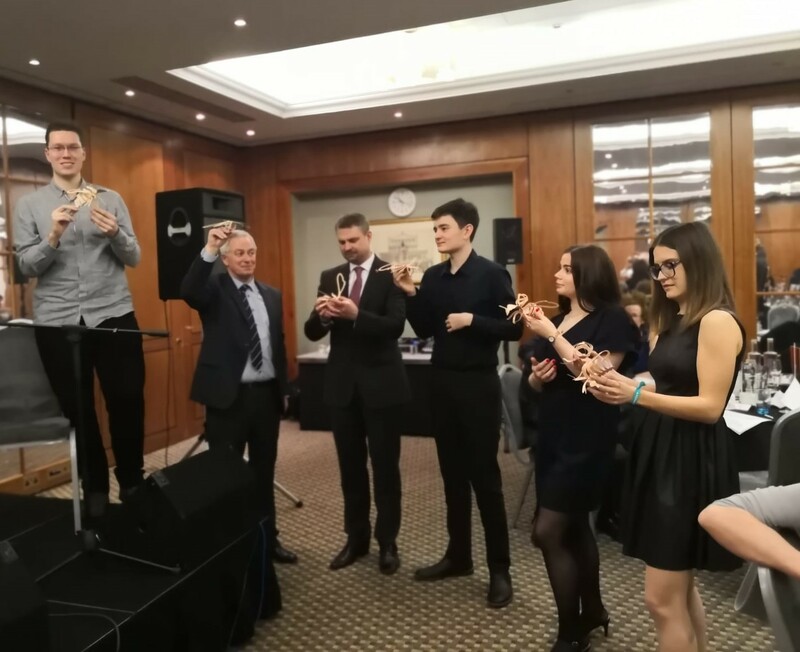 Two up-and-coming young musicians from Slovenia, Gregor Volk and Goran Krmač, enlivened the British-Slovene Society’s 2019 Prešeren Evening on 9th February. And for the first time the Carniolan Bee put in a guest appearance. 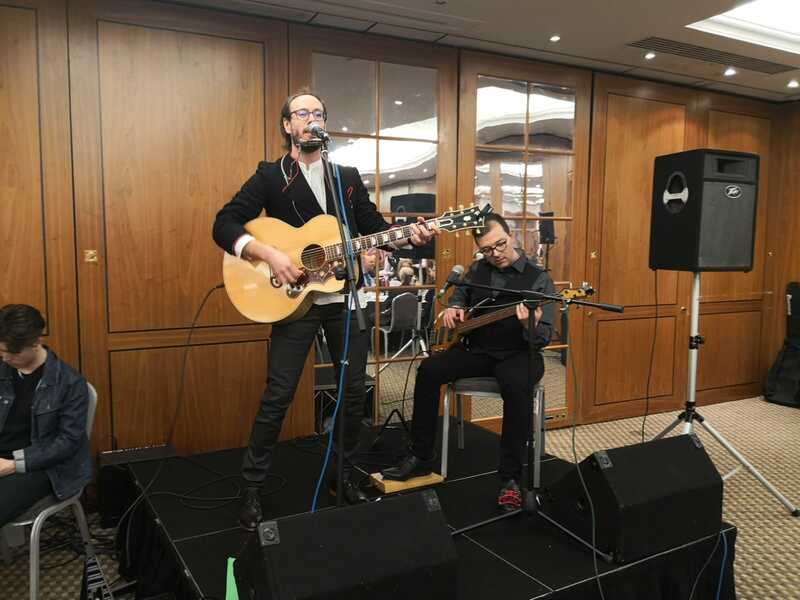 In an evening hosted by Shirlie Roden, who herself sang her ever popular Zeleni Zmaj, the two artists from Slovenia enchanted the 87 participants with their original takes on Slovene folk-songs. The medieval town of Višnja Gora in Slovenia is celebrating its local Carniolan Bee, which is hard-working, not aggressive and has become a favourite among beekeepers around the world. Each table had a paper-cut-out Carniolan Bee to stick together during the meal. It was not easy. In the end the musicians judged which was the best, and the prize of a pot of Carniolan bee honey went to Zala Sekne (right), an undergraduate student at Oxford University. Here she is with the contestants, including Slovenian Ambassador Tadej Rupel, who kindly donated Slovenian wine for the evening. Alas, his bee did not quite make the grade. 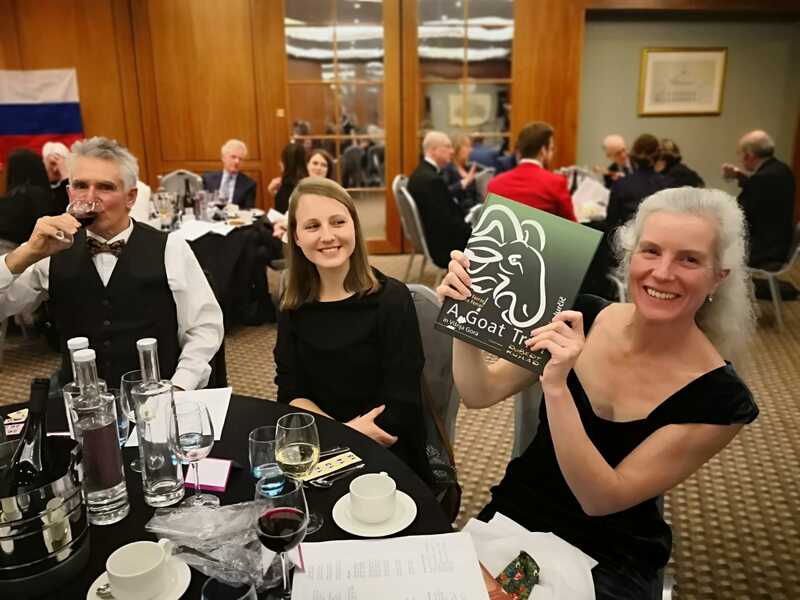 The well-known Slovene story, A Goat Trial, by Josip Jurčič, has been translated into English by Evelina and Marcus Ferrar and was among the prizes in the tombola, which raised £456 for Barka, the Slovene charity for people with special needs. Main prize was a tumble dryer donated by Gorenje. The Government Office for Slovenes Abroad kindly gave financial support to the Evening.